Categories: Sri Chandrasekharendra Saraswati Swamiji. In this age of Kali, dharma is on the fast decline. Virtues and ideals that have been glorified by the Vedas are a rarity. The shastras say that Lord Krishna sends Mahans as his messengers to re-establish dharma. These Mahans lead simple, humble lives showing the common man the path to divinity. One such great soul was Sri Chandrasekharendra Saraswathi Swamigal, the 68th pontiff of Kanchi Mutt. His entire life can be characterized in the same breath as one of divinity and humility. Sri Swamigal was born on Vaisakha Poornima, May 20 1894, in Villupuram, Tamil Nadu. He was the second son of a devout couple, and was named Swaminathan. Right from an early age, Swaminathan’s intelligence awed everyone. He once observed his cousin chanting the Vedas and repeated it flawlessly. An astrologer read Swaminathan’s horoscope and observed the signs of a Mahatma in it. In 1907, Swaminathan’s 17-year-old cousin, Lakshmi Narasimha, was made the 67th Sankaracharya of the Kanchi Mutt. Swaminathan and his mother set out to console his aunt who was distressed as her son had taken sanyasa. En route, they met a senior staff of the Kanchi Mutt who recognized Swaminathan and sought his mother’s consent to take Swaminathan with him. Later, the 13-year-old Swaminathan learned that Lakshmi Narasimha had attained samadhi and that he himself would be initiated into the ascetic order as his successor. Conferred with the name “Sri Chandrasekharendra Saraswathi Swamigal”, he was affectionately called Paramacharya and Maha Periyava (Great Person) by his devotees. Maha Periyava studied the Vedas, classical literature, and several Indian and foreign languages. His teachers were amazed by his intellect and sharp memory. Despite his young age, he was an able administrator. He showed a keen interest in India’s independence. When Mahatma Gandhi propagated the use of Khadi, Maha Periyava followed it rigorously. In 1919, he embarked on a yatra from Rameswaram to the Ganges in order to immerse the sand from the Sethu in the Ganges and demonstrate the cultural unity of Bharat. The journey, covered entirely on foot, took him twelve years. Maha Periyava has lucidly explained esoteric matters in Hindu philosophy in a manner that can easily be understood by laymen. His discourses have been published in Tamil as Deivathin Kural – Voice of the Divine. There is an interesting anecdote from Maha Periyava’s life that demonstrates his intelligence and understanding of the Divine. Once a great scholar was compiling a book on the works of Sri Thiagaraja Swamigal of Thiruvaiyaru. He was puzzled by the phrase ‘Yaantha Baantha’ in one of the saint’s songs. Neither discussions with Telugu scholars nor referring to Telugu literature helped him decipher the meaning of the phrase. Finally he approached Maha Periyava. Maha Periyava asked him what alphabets followed ‘Ya’ and ‘Bha’ in Sanskrit. The scholar replied that it was ‘Ra’ and ‘Ma’ respectively. Maha Periyava then explained that Saint Thiagaraja was subtly referring to the word ‘Rama’. ‘Antha’ means end, so ‘Ya -antha’ and ‘Bha-antha’ meant the alphabets at the end of ‘Ya’ and ‘Bha’ which are none other than ‘Ra and ‘Ma’. The problem that had perplexed scholars for years was solved by Maha Periyava in minutes. In April 1978, at the age of 84, he went on a Pada yatra with a handful of devotees, rejecting all paraphernalia associated with the Mutt. He reached places as far as Belgaum, Satara, Pandarpur and Kurnool with a gait resembling a youngster. Camping out on the roads with the common man he went about showering his grace on everyone. Through his long tenure as the head of the Kanchi Mutt, Maha Periyava has guided innumerable devotees in their spiritual journeys. On 8 January 1994, the centenary year of His birth, the greatest saint of this century, merged with the Infinite. 10 Responses to "Sri Chandrasekharendra Saraswathi Swamigal"
He is one of our family member when i was born in 1981 swamigal only has kept his name to me ( SWAMINATHAN ) this is my god’s gift for me. in the form of human being . A GUIDING SPIRIT for hinduism. One should have done something good as Poorava Punyam to read about him. DOING ONE PROSTRATION every day will purify our sins. 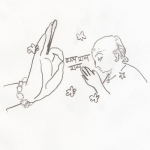 Chanting his name with devotion will bring all joys to our heart . MahaSwamiji is such a great person with chaithanya at his peak. He is a avatara purushan of Lord Shiva.Even now If we go and pray in front of his Brindavan in Kanchepuram, We can feel his presence. As followers, we need to follow his teaching and follow strictly the hindu philosophy,Vedas and live with it. Hare Hare Shankara.Jaya Jaya Shankara ! In the name of “Modern Lifestyle” we are loosing our tradition and culture and ultimately our health is also get spoiled. 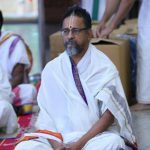 –“Deivathin kural”–of our acharya will lead us to a better path. He Mahaprabhu protect us. He is an Avatar of Lord Shiva.If we surrender completely to him he will take care of us for our entire life and for the next generation in the family also.It can be taken for granted.